Vail Resorts, which in September acquired Park City Mountain Resort from Powdr Corp. for $182.5 million, on Monday announced what it claims is the largest capital investment plan in the history of the United States ski industry — $50 million in spending at both Park City and the adjacent Canyons Resort. Park City Mountain Resort has been added to Vail Resorts’ Epic Pass (Wiki Commons photo). The biggest ticket item is a new 8-passenger gondola that will connect the two ski mountains and create the largest single ski mountain in the U.S. at more than 7,300 skiable acres. Vail Resorts, Inc. (NYSE: MTN) today announced details of the company’s planned upgrades to Park City Mountain Resort (“Park City”) for the 2015-2016 ski season. The plan, which totals over $50 million, is one of the most ambitious and impactful capital programs in U.S. ski industry history and will transform the guest experience at Park City. 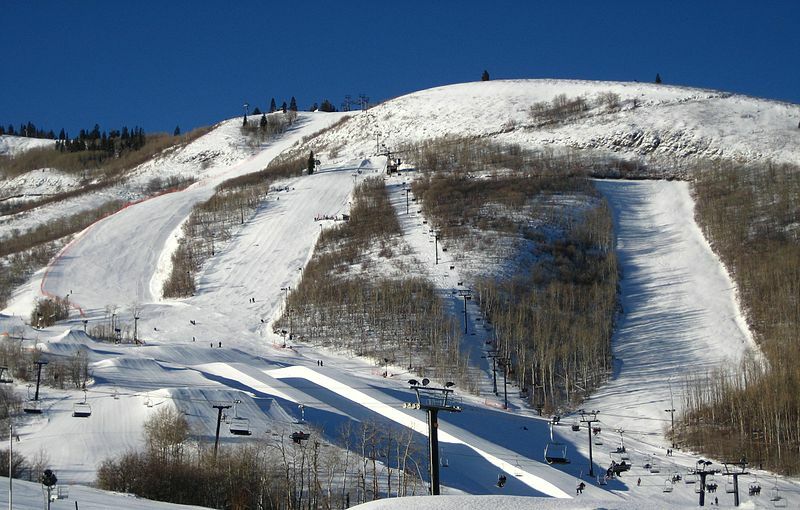 The plan would establish the connection between Park City and Canyons, creating the largest single ski area in the country with more than 7,300 acres of skiable terrain, and complete a number of critical upgrades to the infrastructure of both resorts. The plan will be subject to approval by both Summit County and the City of Park City. The Interconnect Gondola. An eight-passenger, high-speed two-way gondola from the base of the existing Silverlode Lift at Park City to the Flatiron Lift at Canyons. The gondola will also have an unload at the top of Pine Cone Ridge to allow skiers and riders the opportunity to ski into Thaynes Canyons at Park City via gated ski access or to the Iron Mountain area at Canyons through new trails that will be created from Pine Cone Ridge. This will mark the first gondola at Park City since “The Gondola” was dismantled in 1983. Upgrade of King Con and Motherlode Lifts at Park City. The King Con Lift will be upgraded from a four-person to a six-person, high-speed detachable chairlift and will increase lift capacity to this very popular ski pod. The Motherlode Lift will be upgraded from a fixed-grip triple to a four-person, high-speed detachable chairlift, also increasing lift capacity. Both upgrades will reduce crowding, lift lines and improve the guest experience. New Snow Hut Restaurant, Upgrades to Summit House Restaurant at Park City and Expansion of Red Pine Lodge Restaurant at Canyons. The plan calls for building a completely new Snow Hut restaurant at the base of the Silverlode Lift and next to the Park City terminal for the Interconnect Gondola, with 500 indoor seats and a top-of-the-line kitchen and culinary experience. The plan also includes an upgrade to the “scramble” area inside the Summit House restaurant to improve the flow of diners and improve the quality of the experience. At Canyons, the Red Pine Restaurant will be renovated to accommodate an additional 250 indoor seats. This upgrade follows the recent renovation and increase of 150 seats to the Cloud Dine restaurant at Canyons. Snowmaking and Other Improvements. The plan features additional snowmaking on two trails in the Iron Mountain area of Canyons which will become increasingly central ski terrain given its proximity to the Interconnect Gondola. The plan also includes almost $5 million of “catch up” maintenance and upgrades at Park City, given the lack of spending at the resort over the past few years. This “catch up” maintenance spending is in addition to the normal annual maintenance capital for the two resorts of $5 million, which will be undertaken this year as well. For the 2015-2016 ski season, the company intends to operate the two resorts as one unified branded experience under the name “Park City Mountain Resort”. The Canyons base area will be renamed “Canyons at Park City”. The company will continue to maintain the unique history and atmosphere of the two base areas with differentiated marketing for the diverse hotel and hospitality experiences.